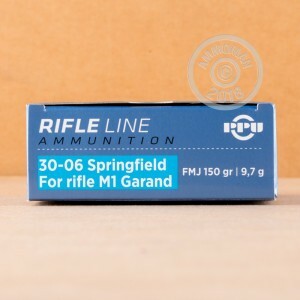 200 Rounds of 30-06 150 Grain Prvi Partizan PP3.48 FMJ Ammo at AmmoMan.com - Free Shipping! The 30-06 Round was the go to ammunition for the US Military for over 50 years. Today It remains extremely popular with hunters and competition shooters. Prvi Partizan makes this 30-06 cartridge with new, reloadable brass cases, non-corrosive primers and a 150 grain full metal jacket bullet. 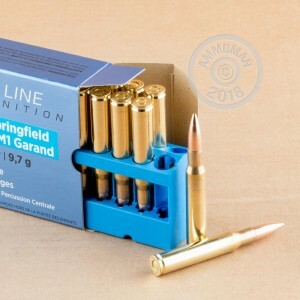 This cartridge is loaded to EXACT M1-Garand specs, from the bullet dimensions to the powder pressure, there's nothing else like it on the market. These rounds performed well. Nice grouping on an FBI Q target at 100 yards. Excellent round for the M1 Garand. delivery was very quick..have not fired any product to date..
delivery of product was a day sooner than expected and i am OK with that..